I met Mr. Renzi in the city. I had an errand for K first, though. back to the rental house. I had told Dan to meet me here. until we found ourselves here. but who IS Pepe anyway? We had a lovely time. We had salad AND fries. whilst sitting behind a young man who looked just like him. It looks like a grand day out! If you find out who Pepe is, maybe you can figure out why he's green. Lovely! I was in the city yesterday, too...the same city that you were in. I'll be back the last week in Feb...are you there often? White Horse Tavern, many fabulous nights sitting outside drinking and socializing. Love it. Yesterdays post-ADD/OC youngest, ADDICTED to Tide Stain pens. Have to buy in bulk. Heaven for stainaphobics who cannot concentrate when there is a SPOT on them. Pepe is green because he is trendy and embraces the global warming movement. So what you're saying is that it was a terrible horrible no good very bad day? Every square inch of this was poetry. The pictures and your words. Looks like you had a wonderful wednesday.. It makes me miss home. Pepe verde is "green peppercorns" as in "filet au poivre vert"
Now I have a craving for a burger... thanks! ooh, I want to play with Matt Damon! oh, maybe that's not what you meant. 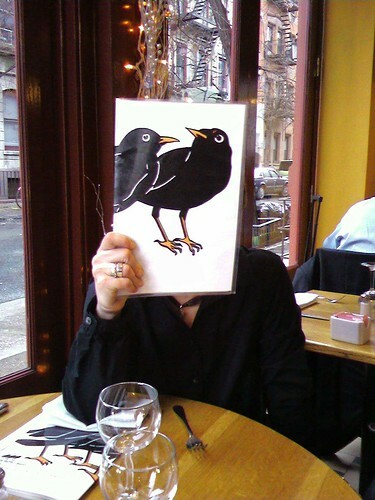 So you ended up having lunch at the Blackbird Cafe? Long lunches with old friends are the best kind. Be honest...this was an uber-cool meeting of Top Bloggers. A sort of Blogging Summit - I am impressed. Did you come up with any strategic decisions for the Future? An invasion of Wordpress or annexing Typepad? Just wondering. I just love how you put together your words and pictures. Love it. That was just incredibly awesome. I love your photo stories.